Samsung Gear VR, the first virtual reality headset of Samsung in cooperation with oculus is out now for purchase. Learn more about this device and how it lets you look beyond periphery. Samsung had promised us days back about a virtual reality headset and here it is available for purchase. If you have a Samsung Galaxy Note 4, then it’s obvious you will be able to taste this classy piece of gadget for an approximate $200 extra bucks. But if you don’t have Note 4 then you have to purchase that also because unfortunately Samsung Gear VR is only compatible with Galaxy Note 4. The full name of the headset is actually Gear VR Innovator Edition. So first when you turn on the device, it will read the following alert “I understand the Gear VR is an Innovator Edition device targeted specifically to developers or early adopters of technology.” So, we can presume that Gear VR is the first stepping stone of Samsung in the world of virtual reality headset already headed by Sony and Oculus. The main aim of this first product is to understand whether people are getting fond of the device or not. It is to ensure if people are finding it amazing and unique from the rest of the devices in market. So right now, at this instance business is not in mind of Samsung. But as soon as it starts collecting feedback, definitely we can expect some overhauls and improvements from Samsung which would be targeted towards a larger population. So the first verdict is always important. Let’s get into a more detail about the device. So basically, the reality is that most people of the world are not aware of what a VR headset is. Hence, this is Samsung’s first attempt to launch it is to make it familiar with common people, so that they get familiar with the concept of VR headsets. 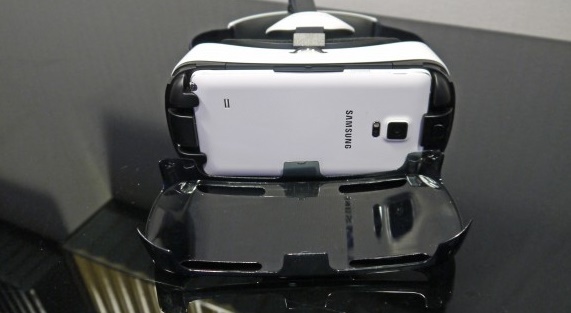 The Samsung Gear VR comes with a panel in the front where you can fit your Galaxy Note 4. The phone is not visible because an outer casing hides it giving it a pro robot look. 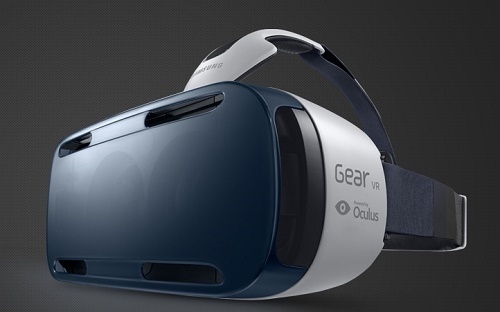 Gear VR is powered by Oculus and Oculus is said to provide a strong support in respect to software and OS to Samsung. When the Note 4 is fitted to the Gear VR, it detects the device and turn the Note 4 into VR mode. You can view things inside through the eye holes of the headset with a FOV of 96 degree. When the Note 4 converts into a VR mode, all you can see is floating widgets in a realistic background giving you the feeling of outer space. Several Samsung apps and general game and media apps will be present which you can select by tapping the touch pad. The touch pad is located at the right side of the headset. There is a focus button and the top and some supplementary buttons.